When becoming in May, the fresh green leaves are fragrant in the early summer sunlight at the lowlands. But in the valley of Four Girls Mountains, such as the larch are just budding, it is in June what the fresh green leaves is fragrant. However, the sprout becomes big in the village on the foot of the mountain, and the birds what comes flying to the end of the garden at the farmhouse increases and becomes busy. Even the Picoides major (Great Spotted Woodpecker) what is rare at the lowlands, is seen around the farmhouse. The Carpodacus thura (White-browed Rosefinch) what is red from the face to the stomach is conspicuous most. This bird that is pecking at the seed with sparrows on the wayside is often seen here and there. Even if the person approaches, this bird does not run away. When becoming in June, this bird is seen at the higher place in the valley. Also a kind of magpie what looks for the material of a nest and the other various wild birds are get to seen in the village and valley, too. On the other hand, at the Wolong where is sited at the east side of Four Girls Mountains with around 2000m high, the wild birds with the vivid color what are seen in the South East Asia and India are gets to seen sometimes from inside of the car on the way to Four Girls Mountains. 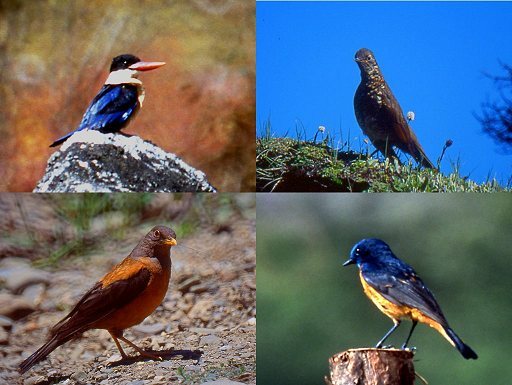 These wild birds are the messenger what bring the full-scale spring to the village and the valley of Four Girls Mountains.